Ever wish for something with every fiber in your body? You wanted it so bad you could literally taste it. Napoleon Hill gave it a name; burning desire. It was more than a wish. At one point in my life. I wanted success so badly it was all I thought about. Sound Familiar? I kept seeing other people achieve amazing things and I kept saying “why not me? I can do that!” I kept believing it and kept saying it, but nothing changed. I bought every book on personal development and motivation that I could find. To be honest I must have read Think and Grow Rich 50 times by this point. Truth be told I never got discouraged but I did start to doubt the steps to succeed in the chapter on Desire. I couldn’t understand what I was missing. I was mistakenly under the impression that if I did not quit, I was being persistent. This was wrong and cost me years of lost time I could never get back. Persistence implies action, pure and simple. To be persistent means you continually try. You take the first step. What do you want to achieve? Start right now! Do not wait for the prefect opportunity, it doesn’t exist. Prove to yourself you believe you have what it takes to succeed- and take action. Have a burning desire to own a profitable business? Take the first step. Decide what success is for you and make plans. Take action, pay attention and then adjust. Then take more action. 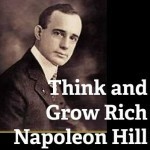 Napoleon Hill talked about money because it was easy to keep score. He could and did, mean any goal you have. Wishing is hoping something good happens, possessing a burning desire as taught in Think and Grow Rich is so much more than having faith. True faith in yourself and your business is displayed when you take action. You don’t blame anyone you take action and keep course correcting until you find the right combination to the lock on your door to success. If you believe most achieve success on the first attempt you are sorely mistaken. If there is one gigantic lesson from Think and Grow Rich it is not the huge success by which we recognize the many names but by how many times they failed and kept on trying.